Sign up and take the Plunge! Or support your favorite team!!! 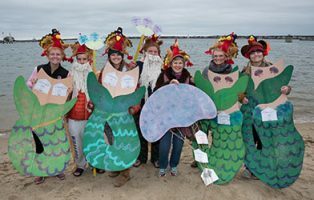 Each year on Thanksgiving morning, hundreds of participants brave the icy waters of Nantucket in support of the Cold Turkey Plunge benefiting Weezie Library for Children. 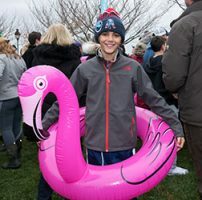 Thanks to the many plungers and business supporters, this fun and frigid event has raised more than $100,000 in recent years. 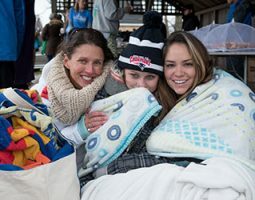 Funds raised from the Cold Turkey Plunge make it possible to host over 500 free programs and services for Weezie patrons each year. If you are interested in volunteering for this event, please contact the Development Office at 508-228-1110 x107. 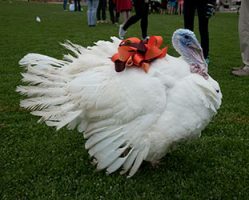 We want to thank over 60 Nantucket businesses for their loyal sponsorship of the Cold Turkey Plunge. Click here if you are interested in becoming a business sponsor for this year’s event. For questions or additional information, please contact the Development Office at 508-228-1110 x107. DO NOT plunge if you have any heart or serious medical conditions, or if you are not used to higher heart rates from physical activity. DO NOT stay in the water for more than a few minutes. Body heat is lost 25 times faster in water than in air. DO NOT dive or somersault into the water. DO NOT drink alcohol prior to the plunge. Alcohol accelerates hypothermia. DO bring a robe, blanket, towel or jacket to wear while waiting to plunge and for when you get out of the water. A towel to dry off as well as an extra towel to stand on is also a good idea. DO bring a buddy with you who is not plunging. Someone on land should know when you go in and when you come out of the water. Change out of your wet clothes and dry yourself right away after you come out of the water. Hypothermia can set in within 30 minutes in Thursday’s expected temperatures.